It’s been here since I can remember is what everybody says, everybody being the born and bred Jersey City folks who grew up in Downtown. Rivera’s Grocery is a bodega on Monmouth and as best as I could determine, the late 50s, and included two generations of owners. Sometime between Sandy and New Years, the proprietor decided to retire to Puerto Rico and sold out. 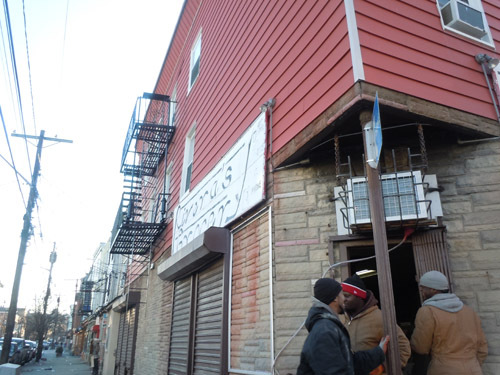 Zoning laws allow only a deli or similar food merchant and the workers said that renovations will soon take place and a new bodega will open sometime in March. I heard all this second hand, so keep that in mind. Cities are like that, something is here one day, just like it has been in what seems like forever but forever is just what you remember. Then that something is gone and the available explanations are just guess work and hypothesis. Does anybody really know? Is it knowable? If it is knowable, is an investigation to find out worthwhile? Maybe knowable is too broad a concept, because who can really understand the nature of time? I would go in there once in a while, buy a diet coke. They sold diet cokes for 50 cents, every other bodega charges 75 cents or higher. I only saw two men behind the counter, one of them was older. Inside was old, plywood walls that had to have dated from the 1970s or earlier. Only one beverage refrigerator worked. The usual inventory of canned and packaged goods –nothing fresh for sale as far as I could tell – lined the shells, which were only about half stocked. A film of dust and grime seem to cover the fixtures and merchandise. On one of the counters was a statue of the Blessed Virgin Mother. 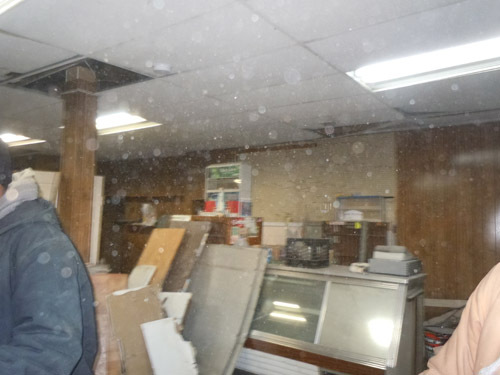 Some men were removing panels and other debris from the store the first Saturday of the year. They didn’t want me to go inside, made me wish I took some photos earlier and did a blog or something. A piece of local history, and the people who made that history happen, just to disappear seems unjust. I took what pictures I could, but inside really was the place that time forgot – or did they just refuse to acknowledge time until time refused to be ignored? I guess the signs will be gone soon too. You don’t see signs like this anymore, hand painted during the hey day of such signage. Humble offerings – milk, soda, frozen food, misc. 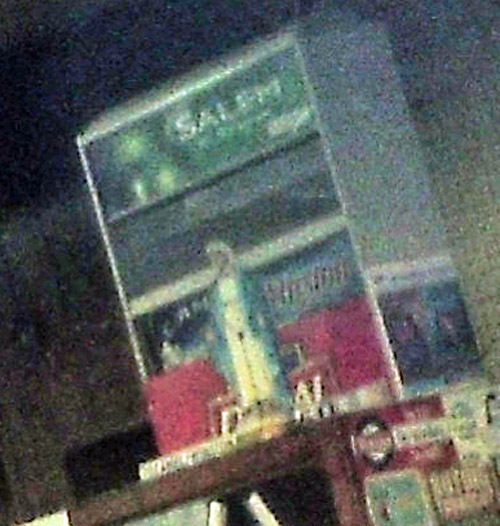 – reflecting an earlier convenient store era. When we think about grocery our minds go way beyond what Rivera’s Grocery still carried. This place was out of date a quarter of a century ago, yet here it was still serving the neighborhood into the second decade of a new century. One of the things that make Jersey City unique is the proliferation of bodegas, those local, stores that sell us needed provisions at affordable prices. They were owned and operated by Puerto Ricans mainly – and if my calculations of the time line given to me are even close to true – that also means Rivera’s Grocery was one of the first. Puerto Ricans are pillars of our community, maybe not dominant but certainly influential power brokers politically. This bodega was here before the white flight diminished the population of Italian and Irish descent, who really were dominant. 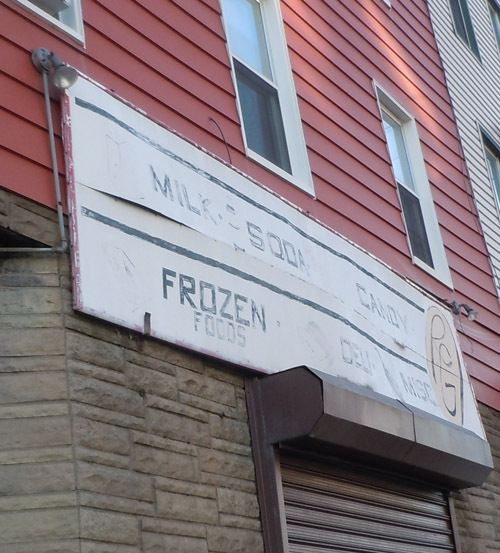 This bodega not only saw the rise and fall and rise of the neighborhood, but also the rise of the Puerto Rican population within Jersey City. In fact, one of the building blocks that enabled ascent was bodegas like Rivera’s Grocery. 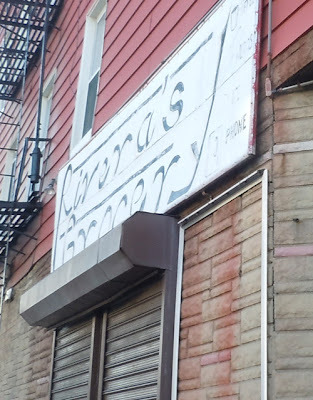 Bodegas are easy to take for granted, but we miss them when they’re gone. They give us all more than we either realize or want to admit.